Slowflow 2010 was a trip down the Whanganui River, Aotearoa/New Zealand between Jan 21st and Jan 31st 2010. 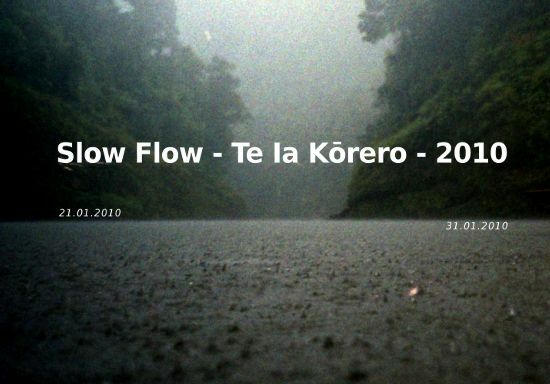 Slowflow will be run again in 2011 dates to be announced soon. 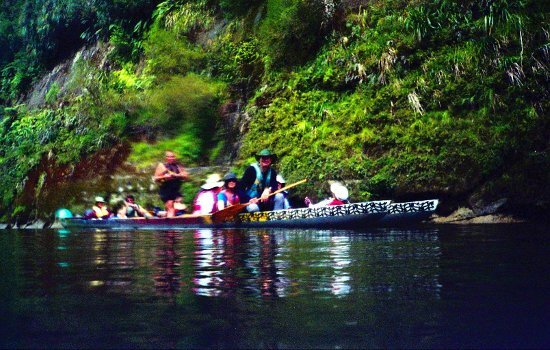 Slowflow invited artists, technologists, writers and environmentalists on a 10 day journey down the Whanganui River by double hulled 22 person waka haurua (canoe) and bicycle, creating a setting for a flow of conversations - Te Ia Kōrero. Slowflow imagines living in a post carbon future where physical transport has slowed to human speed, energy use is constrained and renewable, production is collaborative and relocalised. Taking a few days out from global hypermobility, slowflow models the contemporary ecotopian dream and paddles and cycles it through a landscape of narratives. The journey starts high up the Whanganui River beneath the volcano Ruapehu and passes through the native bush for 5 days by river, staying at marais on the way. Emerging from the forest and shifting to bicycles, it continues to sites of counter cultural interest, Jerusalem, the abandoned Ahu Ahu Ohu commune and the Wanganui Police Computer, before reaching the river mouth and the wider network of the sea. At each site a local expert is invited to give a short talk about the historical context of the site. Participants are asked to bring a project to make or experiment with on the trip. Whether it be a piece of technology, a piece of media, an art work, doumentation of the trip, some writing, or music the collective common wealth of works will form the basis of an exhibition at the Greenbench in 2011. Works from Slowflow 2009 will be shown at the Green Bench opening Jan 31st 2009. All boating equipment will be provided. We have a number of recycled bicycles from Whanganui Green Bikes including one tandem and can provide these for people who can't bring their own. In the lower section of the journey Jan 28th - 31st 2010 Slow Flow opens up to visitors. People wishing to accompany the trip should provide their own bicycle, food and tent and register below. Costs are $100 New Zealand Dollars per person per day. Community Day costs $20 per adult per night payable on the day for camping and facilities - children welcome and free! If you or your organisation would like to offer any kind of support or suggest any other type of collaboration please email slowflow at greenbench dot org. A printable A6 flyer is available here.